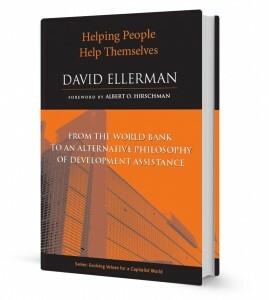 The full title to this book is: Helping People Help Themselves: From the World Bank to an Alternative Philosophy of Development Assistance. The book is an interdisciplinary analysis, giving a full history of the relevant ideas, of the various modes of “helping” in general and development assistance in particular. The interdisciplinary analysis is very much in the style of the late Albert Hirschman who wrote the Foreword. The main case study is the World Bank where I spent a decade learning about its modes of operation from the inside. The book is intended to lay the foundations for an alternative approach. The book is still in print and is available in paperback in all the usual online booksellers. Click here to download the book blurb.